It was the fall of 1991, I had just arrived at Madison Meadows from the harsh streets of Pleasanton, CA (whether or not I arrived in a Nike Flight Suit is still up for debate). Shortly into the fall school year, I had joined the basketball team, and was actually playing well and making some good friends (or terrible ones, depends on who you ask, yeah you Renke). During the beginning part of the season, on a breakaway layup attempt by our opponent, I came from behind and pinned the ball to the backboard, a clean block, but on the way down I landed on the player’s foot and snapped my ankle. 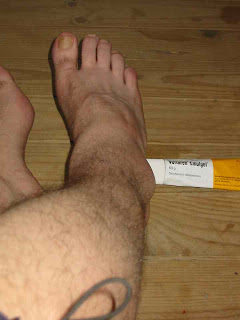 My foot ballooned to the size of a grapefruit and I was shut down for 6 weeks. However, during this time I got my first Arizona girlfriend, (thank you Cameron Mercer), became best friends with Mike Martori, and settled nicely into the North Central life style. This incident is what flashed in my mind this Sunday morning as I was icing what appeared to be fractured ankle (thankfully it wasn’t fractured, just badly sprained). Unfortunately, there wasn’t quite as much glory with the injury that I happened to come by this weekend. Innocently enough, I was playing a game of football with a couple of ferocious 10 year olds. The play I had devised was fantastic (fake hand off, end around, qb fly pattern) but 10 steps into my route, I hit a gopher hole – I dropped the pass, limped back to the huddle and settled in for all time QB with a rapidly swelling ankle. Immediately my thoughts turned to the production of DUNK. Had I injured my foot too badly to continue? Would I be sidelined for too long? How would this impact my workouts? Fortunately I didn’t have to wait long for the answer, on Monday the X-Ray came back negative and three days after the incident the icing and elevation has worked well. Three days off from working out has me itching to get back, but right now my mind goes to all the horrible exercise routines Heather (www.skyfitaz.com) can devise for me with a bum leg. I have a feeling my arms and core and going to hurt a lot. This injury won’t keep me down, if anything it is a refocus, just around the time when everything is starting to feel mundane. There is a difference in wanting to exercise and not having the ability to, and having the ability and not having the desire. Fortunately I still have the desire and the ability will come back soon enough.